If you are planning a trip to Paris, you might be wondering what you should pack. Of course, the content of your suitcase will vary according to the season and the activities you plan to do during your trip. However, there are some basics that you should not forget. Let’s summarize what you will need for a trip to Paris. When out on a city break or a longer stay, the important thing is to stay comfortable to visit all the things you want to see and walk all day long. In order to do that, pack comfortable shoes like sneakers. What’s more, sneakers can go with anything and finish a nice urban look. Even if you are travelling during the summer, sneakers can be worn with a dress. You might want to avoid sandals and flip flops as they are not comfortable to walk for a long time. 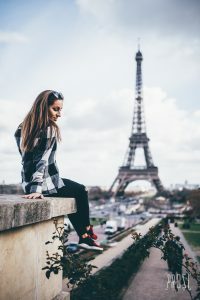 You should also remember that there are a lot of paved streets in Paris, which makes it more difficult to walk on when you do not have the proper shoes. As for your outfits, pack what you prefer wearing and what you feel is the most comfortable to travel. If you are travelling to Paris in autumn or winter, it can get quite cold or even windy. You should also prepare for some rain. You should bring a warm coat, for example a trench coat if it is not too cold or a woolen coat in winter. If the weather is announced to be rainy, a parka or a padded coat will do. A hat and scarf are also great to stay warm when walking the Parisian streets. To free the French woman in you, why not try on a beret? If you plan to go out at night in Paris, check out the places you want to try in order to dress accordingly. You might have to dress better if you plan to try going to fancy places. If you are just planning a cosy and romantic evening at the restaurant, a nice dress and heels are perfect.